A paint-by-the-numbers “epic” story with a prolific number of Stephen King references. 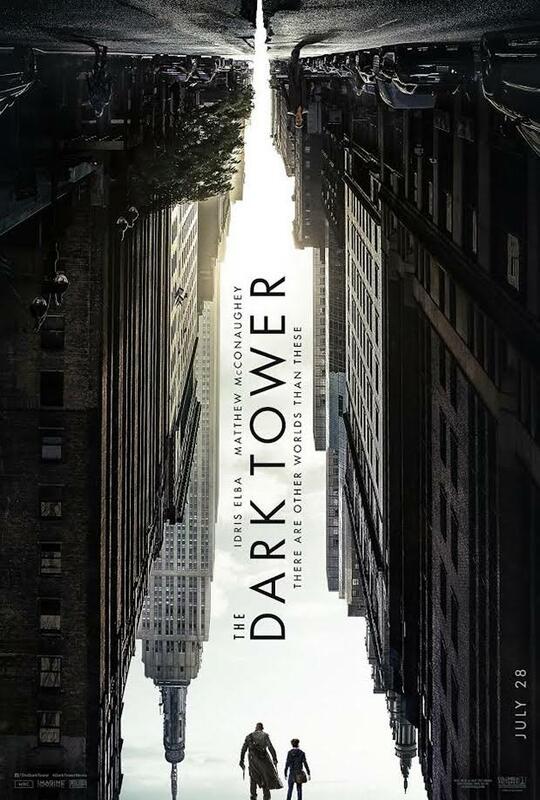 Adapted from the Dark Tower series of novels by Stephen King, Dark Tower introduces movie audiences to one of King’s masterpiece works of literature. Unfortunately, the movie takes place in the middle of the series and fails to leave audiences wanting to see more. For the most part, it offers up little more than an enhanced SyFy Channel original movie or a one-time HBO film. With a powerhouse leading cast consisting of Idris Elba and Matthew McConaughey, it constantly feels that the actors were held back from that which we are normally accustomed. That is, not to say that there aren’t enjoyable parts of the movie–certainly seeing all the King references are fun and it is a great premise. I only wish the story and characters had been allowed to develop over the course of three films. Although there is sufficient evidence to suggest that some movies in the recent past that have been forced into a trilogy instead of a strong, concise single film, this is an example of a one-time film that truly needed the room of three films to develop and emotionally connect with audiences. There is never a dull moment in the film, nor an opportunity to become bored because the film is incredibly rushed and turning points are forced into place. At the center of the universe stands a massively tall dark tower that keeps the bulk of evil forces at bay. Under attack by Walter (McConaughey), the last gunslinger Rolland (Elba) must destroy Walter and his following before they destroy the dark tower and wreak havoc on Keystone Earth and the other planets in the universe. Harvesting children with “the shine” from earth, to use their minds to destroy the tower, is the method employed by Walter and he has his eyes on a child whose shine is greater than any other. After Jake (Tom Taylor) evades capture by Walter’s henchmen, he finds himself on Mid World where he meets gunslinger Rolland. Under constant siege by Water, Rolland and Jake must make a arduous journey to Walter’s headquarters where he is mounting his attack against the tower. With the fate of the universe at stake, Rolland, Walter, and Jake face-off in an epic battle of good versus evil. There is not much to dissect here. One thing is for sure–and I have not read the books–BUT, from what I know of the books, fans of the literature will not like the film because it takes what happens over the course of “King” sized novels and condenses it down to little more than a short story turned 2hr film. Not having read the books, I was not set up for disappointment. That being the case, I enjoyed the film for the most part. But it was obvious that it was incredibly rushed and there was little if any development in plot or character. No emotional investment to be found. It’s a shame; the premise of the film is fascinating and I think there is a high degree of probability that I would have enjoyed following the franchise had it been more than one film. The way the movie ends does lend itself to possible sequels, but after the very “television” feel of this one, it is going to have a hard time convincing future audiences to invest time and spend money on it. If anything, this film does prompt me to read the novels upon which it is based. One argument that could be made in the film’s defense is the same one that can be made when looking at many of the films based upon King’s works. His novels are so dense, internally driven, and detailed that is is difficult to successfully translate effectively from page to screen. Obviously, there are exceptions to this trend (i.e. the upcoming IT theatrical release). If you are a fan of fantasy and adventure films with a hint of science-fiction, then you will likely enjoy this movie. If you love the series of books, I feel fairly confident that you will not like this adaptation. Perhaps this film will inspire a network to spearhead an epic television series. I think that is where this story will be best shown.